The words “pneumatic conveying” can also refer to the use of pressurized air in tandem with a mechanical conveyor belt, but such methods are not as common as those employed in enclosed pneumatic conveying. Industry is beset with challenges relating to logistics. Moving products is always a concern for manufacturers and distributors, and this concern is compounded in the case of very small, hard-to-manage products like granular fertilizer, silica, and powders. If they are spilled or contaminated during transit, it can be very costly. Also, if the materials are hazardous, extra precautions must be made in order to prevent spills while they are transported. 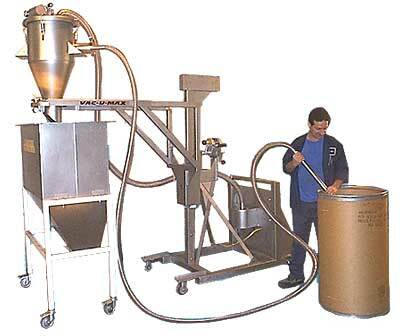 Pneumatic conveying is a safe and effective way of moving fine or powdery solids because the materials can be completely enclosed in conveyance channels as they are transported. Manufacturing operations, farms, distribution centers, chemical processing plants, petrochemical processors, and a wide variety of other large-scale industrial operations can make use of pneumatic conveying for the movement of products. The most common types of pneumatic conveying systems are dilute phase vacuum operation, dilute phase pressure operation, dilute phase pressure-vacuum operation, dense phase pressure operation, and dense phase vacuum operation. Different applications call for different air conveyor varieties. Vacuum conveyor systems can feature multiple product inlets when equipped with diverter valves; the valves allow for the selective closure of inlets to minimize suction loss through inactive inlets. They can be effective as unloaders for this reason. But vacuum systems are less effective over long distances because of their low pressure generation capacity compared to compression systems. Dilute phase pressure systems can easily achieve a higher pressure differential (which is the difference in pressure between a pressurized enclosure and the natural pressure outside of the enclosure) than can most vacuum systems. Pressure-vacuum operation, which utilizes both methods, is useful for some conveying setups; railcar unloading is one example. In pressure-vacuum railcar unloading, the contents of a railcar are removed with a vacuum and then forwarded to their destination by a blower. In every application, conveyor system configurations are chosen based on the properties of the products that will be moved through the system. Lower velocity bulk phase operation, for example, is often chosen for the transportation of highly abrasive products or for those prone to degradation, as they are less likely to cause damage or become damaged themselves when moved at low speeds. Pneumatic Conveying Pneumatic conveying is the process of moving objects with streams of compressed air or with powerful vacuums through an enclosed channel.